Well, it’s that time of the year again. The time of year when I stop to look back and appreciate everything that has happened to me, recognize how I have grown, and remember everything that I was thankful for during the past year. I thought it would be good to actually write all of these wonderful things down and give you all a bit of a life update. I’ll call it my Christmas card for 2013. I did not waste any time getting started in January of 2013 as I began a missions class with my Church called Perspectives. The class is offered every year from January through April and a couple of people who went to East Asia with me last year recommended it, so I decided to take the plunge. It was a lot of work having class for 3 hours every Sunday and working on 5 or so hours of reading/homework every week, but I am very glad I took Perspectives and I feel much more prepared and excited for world (and local) missions for when/where I am called. All throughout the year I was involved and invested with a community of young adults called Abide. I first became connected with the group when I moved back to the Tri-Cities in September 2011. Through my period of unemployment, Abide was there for me and I was able to give all of the time I had to this young ministry. I am very thankful for the young adult pastor, Jonathan Shradar, and his heart for reaching young adults in the Tri-Cities with more than just events and hang-outs, but by truly preaching the Gospel and knowing that the Lord will use this good news to draw all to Himself through his son Jesus. Since I found a job in May 2012, I have continued to be blessed by the people in this community and throughout 2013 they were there to preach the Gospel to my face when I needed it. Speaking of Abide, once a week we have a gathering called Abide Assemble where we invite all young adults to join us for an evening of worship through singing, sitting under Biblical teaching, and discussing Biblical ideas. In February I was given the authority to preach a sermon to my fellow young adults in this venue. We were working through the book of Hebrews and I was tapped to cover 3:7-4:13. You can listen to it here, but my theme was about entering rest by fighting unbelief through community and preaching the Gospel to each other. I had a few other opportunities to preach at Abide Assemble during the year and I will mention those times later. Earlier I mentioned that, after months of looking, I finally found a job in May 2012. This job was, and still is, at Pacific Northwest National Laboratory here in the Tri-Cities. I work in a glass research laboratory performing research on the conversion of nuclear waste to glass, which is the focus of the Waste Treatment and Immobilization Plant being constructed here in the Tri. The work is much more material science and less chemical engineering like my degrees, but it is performing research which is what interests me much more than general chemical process engineering. Anyways, through my job, I had the opportunity to travel to Phoenix, AZ for a conference in late February. I traveled to a conference in graduate school, but this was the first time that I actually presented in front of an audience made up of more than just my fellow graduate student peers. It wasn’t a very long presentation, but I felt like I did an effective job of communicating my research to the group. It was also fun to be away from the cold weather of the Tri and in the warmth of Phoenix for five days. In addition, I was able to visit my friends Mike Knollmeyer and Alex Edstrom who live in the area and eat some delicious Caribbean food with them! I’m headed back again this year and I am really looking forward to it! Right after I returned from that trip to Phoenix, during the first weekend in March, I had the pleasure of hosting a couple of grad school buddies, Tom Jacroux and Stephen Davidson, at my apartment in the Tri for a few days. We had a good time doing those 3 things that are fun to do in the Tri-Cities, haha! Seriously though, I love the area in which I live and there are many fun things to do/places to see here in the thriving 250K person area of the Tri-Cities. If any other of you friends from out of town would like to come to the Tri for a weekend, I would be happy to have you stay and hang out with me; we can see the sights and I can hopefully share with you the joy that I have for my community. Part of that joy includes Sharehouse, the largest coffee-shop in the area. Sharehouse would only be average sized compared to many of the coffee-shops in a college town like Pullman, but in a non-college centric area like the Tri, it is positively gigantic. It was started by my Church as an outreach opportunity to the young adults in the area who have very few options for late night entertainment that doesn’t revolve around alcohol. As such, Share hosts many events throughout the week including live music on Friday/Saturday nights and it is the setting for Abide Assemble on Thursday nights. I also attend a small gathering at Sharehouse early Tuesday mornings called Theological Life. It is a great time of discussing theological truths and revealing Christ to each other through what can often be difficult theological topics. I have grown and learned a lot through this time and I encourage any young adults in the area to join us on Tuesday mornings at 6:30 AM (super early for me!) for this discussion. Easter was super early in 2013, falling at the end of March. I went to a couple different Good Friday services this year (at Westside Church and Bethel West Pasco) and they were both powerful remembrances of what Christ endured for me and all of us on the Cross. Resurrection Sunday then was a joyous celebration of Christ defeating death and returning to earth to reveal to his disciples and the whole world what he had done and why it is our good news. This is the holiday that has changed my life the most and I hope you were able to rest in its truths this past year. On the first Thursday in April, I was able to preach my second sermon of the year at Abide Assemble, this time covering the whole chapter of Hebrews 11 and peeking into the first couple verses in chapter 12. You can listen to that sermon here, but the theme was about how our faith is tied to reward and while the many who came before us might not have known that reward, we now know that the reward of our faith is Jesus! About a week or so after that was my birthday! I had a great day first serving with my friends at Abide by helping trim and clean around an elderly woman’s house, then watching Jurassic Park in 3D thanks to my friends Scottie Duclos and Brandon Lattin, and finally celebrating together with a large group of friends at White Bluffs brewery. I have a wonderful group of friends who are willing to organize a large and hectic get together for my birthday just to show me that I am loved. I would run out of time and blog space simply explaining to you the different ways that they have encouraged and lifted me up over the past year, but I’ll suffice to say that we have done many things from going to hockey games, having pajama parties, themed game and movie nights, hiking the tiny hill that we in the Tri call a mountain, or preaching the Gospel to me when I am tired and want to be selfish and do my own thing thus forsaking the joy of glorifying Christ. My friends really, truly are incredible and even if I don’t have a chance to mention every one of them here by name, I love them all and would love to have you come and meet them sometime. The Perspectives class that I started in January ended at the beginning of May. As stated earlier, I think I learned a lot about missions over the course of 4 months, but the class was a lot of work and I was glad to have a few more free hours during the week after it ended. One of the final activities that our class did together was to visit a mosque here in the Tri and talk with/get to know several of the people who worship there. It was an eye-opening time in which I learned a lot about the Islamic faith and built a few relationships with the members. In the middle of May, I ran in my first 5K with a paid entry fee. It was a Run for Rice sponsored by my Church to raise money for Agape International working in Cambodia. I am absolutely not a runner or someone who enjoys the act of running, but while unemployed and living at my parents’ house, I realized that I was not moving around as much as when I lived in Pullman with my 45 minute walking commute in the hilly and often icy conditions. So I begrudgingly began running a mile a couple times a week during my unemployment period. Even after I found a job and was moving around more, I kept up with running on a regular basis. Now I try to run a 5K in my neighborhood at least once a week just to stay in shape. It’s still not something that I enjoy in the slightest, but my approach to fitness has been to stay healthy in order to have as many minutes as possible on this Earth to proclaim the good news of what Christ has done for me. Engaging in the Run for Rice was a bit of a personal milestone towards commitment and keeping with this lifestyle and mindset. Over Memorial Day weekend I traveled with my friends Dave and Kate Hewitt to Seattle to go watch a Mariners game. We traveled up on Saturday (after a brief run to Prosser and back because Dave forgot his wallet, haha!) to watch that evening’s game in the King’s Court with Felix Hernandez pitching. The King’s Court was a great experience, even if Felix and the Mariners did not get the win that day, and we had a great time with our good buddy Kyle Lemiere. Such a great time in fact that we decided to go to the game the next day on a grey Sunday afternoon in Seattle. This game was a well-pitched, low-scoring affair that went into extra innings. This lead to one of the greatest scenarios to witness in baseball: a walk-off, extra-innings win by the team I was rooting for!! It was a blast and we had the opportunity to sit in the front row for part of the game, which was a great perspective. The following weekend, I traveled with my Abide Advisory board peeps to Moses Lake (about 1.5 hours from the Tri) to attend the Passionate Grace conference with speakers Jared Wilson and Bryan Chapell. Mr. Wilson is a pastor/author/blogger who I really admire and who preaches the Gospel clearly and exclusively in all of his sermons, so it was a joy to listen to him speak and to meet him. I hadn’t heard Mr. Chapell before, but he was similarly a very Gospel-centered pastor and he gave a great sermon about Gideon. It was fun to spend time with everybody on the Advisory board too and even get to play the drums for a few songs! It had been a while since I had the opportunity to do that! I came back home from the conference and had to say one final goodbye to Kate Hewitt before she headed off to serve with the Peacecorp in Moldova for 2 years. Miss you Kate! I was able to visit Pullman in early June, reconnecting with a good many people over the course of less than 48 hours. Pullman holds a special place in my heart and I always enjoy the chance to get up there, even if I do happen to help Derek Nevins move every time I visit, haha! Unfortunately I had to head back to the Tri before Resonate Church’s service on Sunday night, but I still was able to visit with most of my friends who live up there year round. I hope to make it over again sometime this year to see you again. The next weekend we celebrated Erica Cox’s birthday with a dress-up, classy bowling night, which was a blast! The following day a group of us went to the Pasco Flea Market and an outdoor Eclectic Approach concert, both of which were quite fun. Later in the month, I was able to see my favorite band, mewithoutYou, live in concert! It was a crazy experience that I am glad I was able to journey through with my good friends Josh Alvarez and Damen Bircher. The concert was on a Sunday night in Boise, ID, about a 4 hour drive from where we live, with an added hour due to crossing a time zone. Our plan was to leave around 12:30 and have plenty of time to grab dinner in town and see the two opening bands. 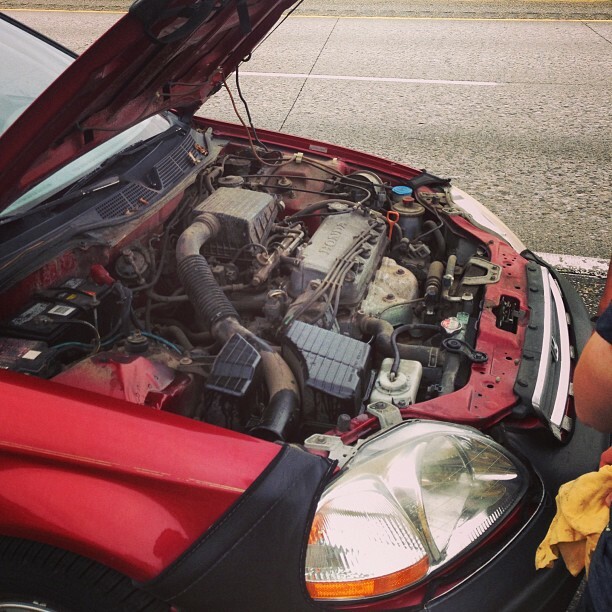 Then, only about 10 miles out of town, the engine on my car overheated due to a cracked and leaking radiator. We tried to turn around and take my car home where we could switch it out for Josh’s car, but the engine was way too hot and it wasn’t drivable. Thankfully Josh’s Dad owns a towing company and he was able to tow my car back to my apartment without much trouble. When we got back, there was just enough time to make it to the concert if we left immediately and didn’t mind missing the opening bands. And we were just crazy enough to do so, haha! It was an incredibly memorable trip and we even were able to visit briefly with my friend from Pullman, Alyssa Long, while we were in Boise. Right after we arrived home from the concert, I ran off to meet some friends for a goodbye dinner for Annemarie Nechodom who was living the Tri and heading to Bolivia to work in an orphanage for a year. It was sad to say goodbye to Annemarie, but I’m excited for what she is doing and how she is following the Lord’s call in her life. Plus, that night we were able to watch her favorite movie, “Nueve Reinas (Nine Queens),” and it was quite good! The fourth of July was a fun time this year with a big get together at Jess Willard’s place where we BBQ-ed and watched fireworks from the roof of her house. Later during the weekend after the holiday, I played disc golf on the new course in the Tri (at the park behind Fred Meyer) with Luke Hallowell, Jonny Farwell, and Kylan Frost who was in town from the west-side of the state. It is a pretty good course and much bigger than I thought given its location. In the second week of July I took a vacation, for the second time in about 3 weeks I travelled with Damen, down to California for Marques Rodriguez wedding. It was a long 14 hour drive (rental car, yeah!) down to Rocklin, CA, but it was awesome to spend some time with Marques and go to his wedding to his beautiful wife Megan. They even decided to move to the Tri in the fall, so I get to see them on a regular basis, which is wonderful! The trip was pretty relaxing; we just saw the sights, went to coffee shops, went swimming, and did nothing. The drives weren’t fun, but Damen and I rocked out to plenty of music, bonded, and missed an exit or two. It was a nice escape from the Tri, though the weather was about the exact same in both locations. The very next weekend, Jonny and I traveled over to the west-side of the state for Mark and Rachel Campbell’s wedding. They had a wonderful outdoor wedding and I was able to see several Pullman friends again! We stayed with Branden and Laura Garrett in their new house and of course a midnight Taco Bell run ensued. Additionally, we had breakfast with Chris and Lena Voth and were able to meet their son Gabriel. The little guy is just as stunning as his parents! 😉 It was great to see them for the first time in about 2 years. The other big thing that happened in July was on the work side of things. I was hired at PNNL as a Post-Masters Research Associate in 2012. I knew going in that this was a temporary (2 year) gig, but I was fortunate enough to simply have a job and I wanted to see where the Lord was leading me after that time frame. After familiarizing myself with the national lab again, I enjoyed the glass research that I was doing and, more importantly, I really enjoyed the people in the Abide community where I felt like I should invest more of time. So in December 2012 I began to talk with my boss about moving to a full-time position at PNNL. Thus, in July 2013 I was promoted to a Material Scientist, Level II, which is a permanent position at PNNL. Moving into 2014, I am still very excited about my new position and even more excited that I will be able to remain a part of this community in the Tri for however many years that the Lord will have me here. This new position has been a blessing! My brother Brett and his wife Rachael came by the Tri for a visit in early August. It was the first time I had seen them since their wedding in June 2012, so it was wonderful to catch up with them. I got to take them to Sharehouse, introduce them to a few of my Abide peeps, and even watched the latest, stupid G.I. Joe movie (Ninja Mountain!!) with them and Micah Stewart before he headed back to East Asia. 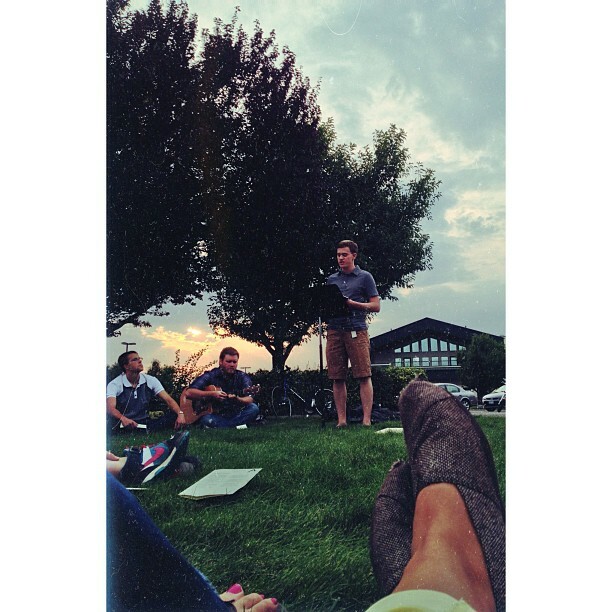 During July and August we met outside for Abide Assemble and went through an awesome book of Puritanical prayers called the “Valley of Vision.” Jonathan didn’t preach at all during those couple months and instead he allowed us young adults to preach every week. It was wonderful to hear the Gospel preached from the mouths of so many of my good friends. Not all of these sermons were recorded, but I was able to preach one about a prayer titled “Divine Support” and it can be found here. I really love that prayer and used it to talk about where we find our joy. My co-worker Steven Luksic had his 27th birthday in August which also had an accompanying birthday party…that was Harry Potter themed…and had a bounce house, haha! It was quite a fun party. Although, in the process of trying to climb backwards up the water slide that was attached to the bounce house (yeah, it was an awesome party), I tweaking my lower back. I’m not quite sure what exactly happened, but I figured I would sleep it off and the soreness would go away just like pretty much every other time I have pulled something since I was born. Only this time, that didn’t happen. I can still feel something in my back and when I sleep my back often tightens up and makes it difficult for me to breathe while laying down without pain. This pain ended up being a big part of the rest of my year as I am still dealing with it some nights even now. After such persistence, I am going to see a chiropractor this month. Any suggestions about who to visit here in the Tri would be helpful. In September we experienced a few summer storms here in the Tri. One of such thunderstorms occurred on a Thursday when my friends Jessica Willard and Josh Alvarez were planning to get baptized in the Columbia River. They asked me if I would be willing to baptize them and I said heck yes! But when we arrived at the river about 45 minutes before the baptism was set to take place, lighting actually hit the water around where we were planning to get in. Nevertheless, the lighting passed fairly quickly and Jessica was just crazy enough to still want to get baptized on this crazy day, haha! It was still raining and windy, but fairly warm overall and the water of the river really didn’t feel all that cold. It was a crazy experience, but we were all super excited to celebrate Jessica’s commitment to Jesus even with the crazy weather. Abide went on a rafting trip the weekend after Labor day and that was a good time despite a fire ban which caused us to limit our hot dogs and s’mores to grill food. It was a little cold and windy for the rafting portion of the trip on Saturday, but none of our rafts flipped, no one fell out, and we had a good experience/work out. The end of September was also when I started my second theological class of the year, Porterbrook. Porterbrook is actually still going on (through May 2013), but it only meets once a month as opposed to Perspectives earlier in the year which met weekly. This has been nice because it allows me to take a weekend off from studying and not fall behind in the class. It’s a little bit more work than I expected (read a 60-100 page booklet, answer 30-40 short response questions, write a 1.5-5 page essay, and answer a test on the previous unit), but I am staying above water and learning a whole bunch! The others in the class aren’t a part of my “normal” young adult friends and it is really fun to discuss theology with them and hear their different perspectives. There is still more learning to come! From September through November we went through the letter 1 Peter at Abide Assemble. In early October I was asked to preach on chapter 2 verses 4-10. I used this passage to talk about Jesus being our cornerstone, but also how some see him as a stumbling block and how we as believers should not hold others to a moral standard (the law) unless their foundation is Jesus. Without Jesus who fulfilled the law, we would be living in empty moralism, and we must not force the law on others unless we show them that Jesus has fulfilled the law. You can find that sermon here. In mid-October I drove up to the Wenatchee area with Jon and Nathan Door for the wedding of Noah and Kate-Lynne Holt. It was a beautiful wedding and there were again a lot of good friends from Pullman that I had the opportunity to reconnect with. Blessings to the Holts! Halloween was a fun time this year and I didn’t even have to plan a party to make it so, haha! Abide Assemble fell on the day of Halloween and, while it was a small crew, a few of us dressed up like goofballs and we got to listen to Marques preach a sermon about one of my favorite verses in the Bible (1 Peter 4:13). The following night, the girls at Casa Mufasa threw a fun Halloween hang out/game night shindig and it allowed me to once again dress up as the Middle Man. 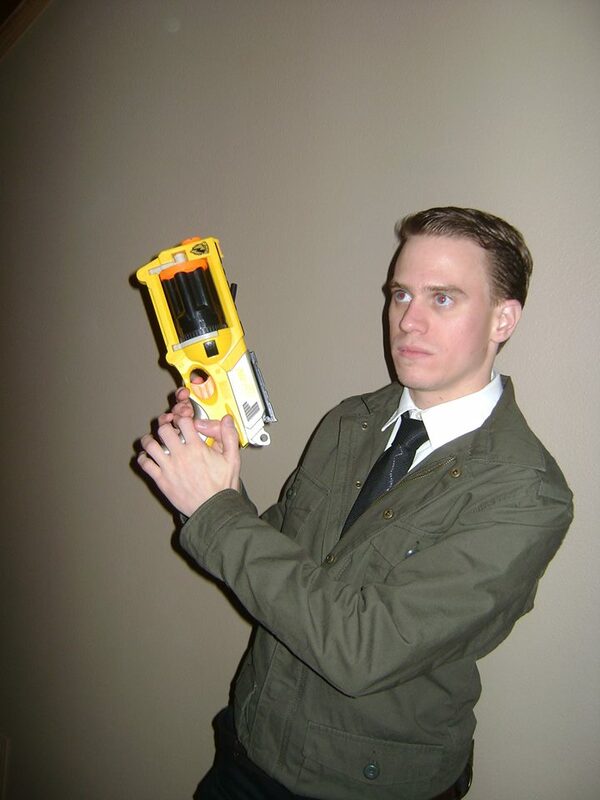 It was a fun and pretty simple costume plus it allowed me to tell a lot of people about an awesome little TV show that they might enjoy. Win-win-win. The deadline for turning in Operation Christmas Child boxes always lies sometime in the middle of November. This year the guys in my small group decided to pack a couple boxes together for OCC! It was a great experience and I hope the children that received the boxes were blessed by these wonderful guys and their hearts for helping others. I have loved being able to lead the guys throughout the year as we studied a book (“Basis,” written by Jonathan about the basis of our Christian faith), discussed the prayers in the “Valley of Vision,” talked about money with the rest of Bethel, and began watching a John Piper video series. I feel like I can discuss anything with these guys as we constantly preach the Gospel to one another and season all of our conversations with grace. It was a great year with them and I am looking forward to the next as we continue to explore the depths of what Jesus has done for us. 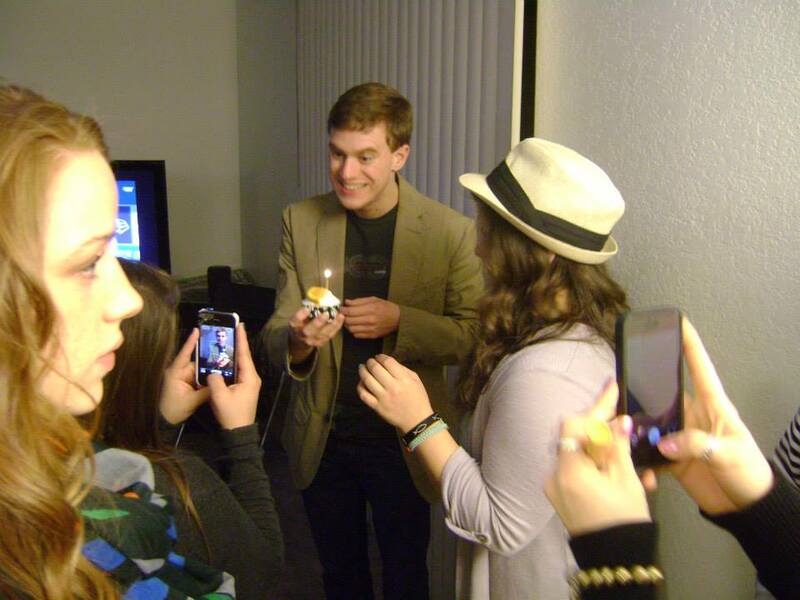 Before people parted their separate ways for Thanksgiving (which was really late in the month of November in 2013 by the way), myself and the friends threw a kinda-surprise party for our dear friend Shelby Gunion. She knew that we were all planning on coming over that night after she ate dinner with her family, but she did not expect that we were going to arrive early and decorate her apartment for her birthday. It was a lot of fun to surprise her (and Shannon as well) and we had a great night of celebration. My family didn’t travel anywhere for Thanksgiving this year, so I had a nice quiet afternoon/evening with my parents. We ate plenty of food, played Ticket to Ride (of course Dad won), and Skyped with Brett and Rachael down in Texas. The next day was the Apple cup and I invited both WSU and UW friends over to my place to watch the game. Both of the UW fans showed up at halftime…right when the game turned in their favor. Thus they were able to rub the victory into everyone else’s faces. Thankfully Steven and Kathy were gracious and didn’t make fun of us WSU graduates too much. There’s always next year (and the year after that, and the year after that, and…)! December was a hectic and short month due to the multiple holidays making the last week and a half of the month a fairly separate, quiet, dead time. In addition, my Porterbrook class met earlier in the month than normal due to the holiday, so I had a bit less time to study. The night before Porterbrook I also preached the last sermon at Abide Assemble for the year. It was the closing sermon of our brief (3 week) Advent series and I used Matthew 1:18-25 to talk about how we cannot simply focus on the birth of Jesus during the season of Christmas. If His birth does not point us to the Cross, then we have missed the point of His ministry here on Earth. You can hear that sermon here. The end of the year brought lots of gatherings and parties and celebrations. We had a combined guys and girls, small group, mocktail party which was a blast. We dressed up and mixed a lot of random drinks, most of which ended up tasting pretty good! The friend group had one last get together before everybody went home or vacationing for the holiday and during that gathering we had a beverage exchange, which, in my opinion, was more fun than the typical white elephant crap exchange. Right before my family went to visit the relatives for the holiday, I was able to have lunch and catch up with an old friend, Josh Bond, who was in town for a few days. We hadn’t had the chance to chat in a couple of years, so it was great to reconnect with him. It was good to see most all of my relatives for Christmas. Brett and Rachael went to Denver for the holiday and one of my uncles was in Canada with his wife’s family, but other than that I think I was able to see everybody, rile up as many of the cousin’s little kids as possible, and begin looking forward to seeing them all again next year. We were even able to stop by Jonathan’s in-laws for an hour and visit with them and the Shradars for a bit. Overall it was a good year of growth and learning. For the first time in several years, I didn’t have to move or get a new job, so it was nice to have that stability for the first time in a while. It was a bit weird taking classes (Perspectives and Porterbrook) for the first time since late 2010 in graduate school, but it was information that I was eager to learn and that fact pulled me through the times when doing homework felt like a grind. I am thankful for the people who were in my life who preached the truth of the Gospel to my face during the times that I needed to hear it. And now I am excited for whatever mysteries, revelations, and adventures 2014 will hold!